Risk Breakdown Structure (RBS) is a hierarchically organized depiction of project risks into categories and sub-categories. In an RBS, risks are organized and structured in such a way to provide a standard presentation of project risks that facilitates understanding, communication and management. It looks very similar to the Work Breakdown Structure (WBS), but both serve different purposes in a project. As with WBS, RBS also starts with major risk categories and then decomposes them into more detailed ones. RBS reminds participants in the risk identification process of the many sources from which risks may arise. 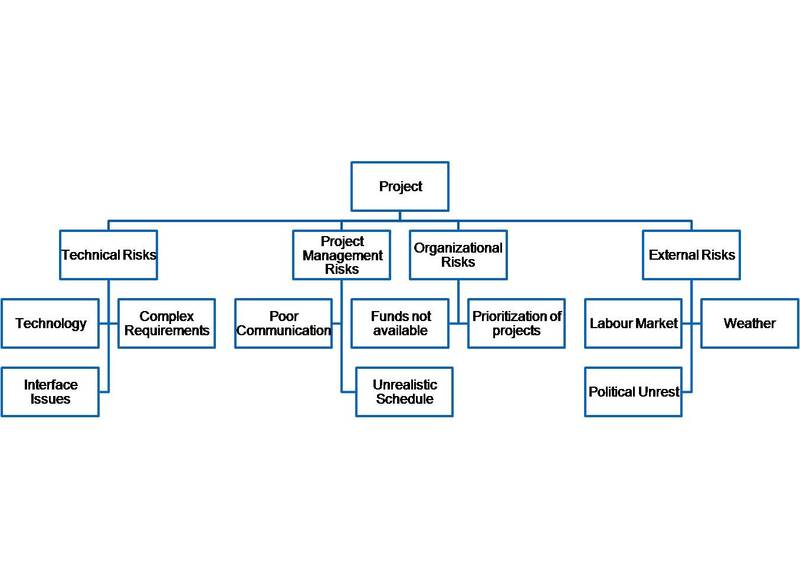 Each descending level in a risk breakdown structure represents an increasingly detailed definition of sources of risk to the project. A very simple Risk Breakdown Structure is shown below to illustrate the concept. In a real project, the RBS will have many more elements. What do you mean by risk categories? Risk categories are a group of potential causes of risk in a project. And what is the use of categorizing risks? Risk categories generally provide a structure to systematically identify risks in a consistent manner. It helps the project manager and project team and contributes to the effectiveness and quality of the “Identify Risks” process. It provides a logical way to organize the project risks to better manage them and to determine the root causes of risk. Categorizing the risks also would be much beneficial while planning response actions for the identified risks. Risks can be categorized in various ways like External, Internal, Technical or Project Management related risks. Risks can also be categorized based on the origin of the risk like Schedule Risk, Cost Risk, Quality Risk, Scope Risk or Resource Risk. Depending on the project and the organization, the risk categories can be as simple as a list of categories or it might be structured into a detailed Risk Breakdown Structure (RBS). The following are the Inputs, Tools & Techniques and Outputs (ITTO) of the process "Plan Risk Management", which is the first project management process in the Project Risk Management knowledge area. Enterprise environmental factors: Risk attitudes and tolerances that describe the degree of risk that an organization will withstand. Organizational process assets: Risk categories, common definitions of terms and concepts, standard templates, authority levels for decision-making, lessons learned, stakeholder registers. Project team hold planning meetings to develop risk management plan. Attendees may include project manager, selected team members and stakeholders, anyone with the responsibility to manage risk planning and execution activities. High level plans for conducting the risk management activities are defined in these meetings. Risk management responsibilities will be assigned. Probability and impact matrix will be tailored to the specific project. If templates do not exist, they may be generated in these meetings. The only output of this process is risk management plan, which becomes a subset of the project management plan.. The risk management plan describes how risk management will be structured and performed on the project. It tells you how you are going to handle risk in the project. It defines how risk will be assessed, who will be responsible for doing it and how often you will do risk planning. Risk Management Plan includes the Methodology, Roles and responsibilities, Budgeting, Timing, Risk categories, Definitions of risk probability and impact, Probability and impact matrix, Revised stakeholders’ tolerances and Reporting formats. In other words, project risk management is a part of the project management, which deals with uncertain events in a project in a proactive manner. It helps a project manager to ensure that the project is completed on time, within the budget and to the project requirements.